As you’ve probably learned, the basic currency for anything you buy or do for a boat these days is a boat buck. And a boat buck is a thousand-dollar bill. When they say shopping is therapeutic, I don’t believe “they” are thinking about boat bucks. When it comes to boat stuff, more and more of us are trying to get our therapy these days with saving rather than spending. Some are even curtailing their boating or getting out of it. But this isn’t the way to go. The trick is to find those situations where shopping for the right kind of boat stuff can save you money in the long run (or far better, the short run). There are even things you can do that’ll save money without spending any. The kind of things I’m talking about will depend on the type of boat you have, the type of boater you are and the type of boating you do, but all of us can cash in if we keep a weather eye for golden opportunities. Tidal currents can make a huge difference in fuel savings — for planing boats as well as displacement boats. We all know this, but often we don’t pay enough attention to the important subtleties. 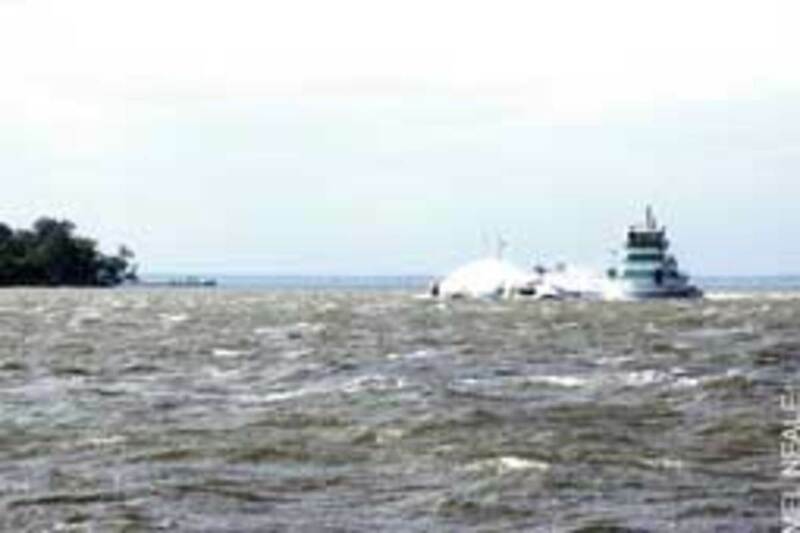 The effect of current on a displacement boat, moving with much of the hull down in the water, is obvious. It can add hours and bucks to a trip. It doesn’t even have to be running against the boat. For example, the current running strongly from the south in Gulf Stream crossings can necessitate crabbing, which adds miles, and therefore hours, and therefore many gallons of fuel to the trip. But people zooming along on plane also should watch the currents. Even though you’re up, with very little hull in the water, you’re still moving with or against a flood of water. The water resistance to your hull won’t affect you as much as it would a displacement boat, but it will make a difference. Current also can affect the planing boat in other, more significant ways. A current against the wind can increase chop and waves dramatically, just as a current running with the wind can significantly decrease them. If this running into sea slows you down to a hull-in-the-water speed, you may be consuming much more fuel because the efficiency of your rig may have decreased and the trip is going to take much longer. 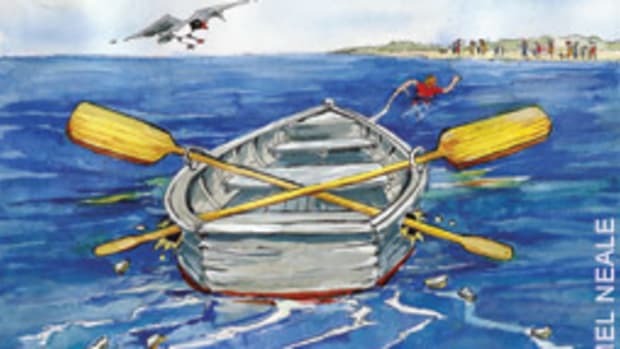 Or waves or chop may not force you down to hull speed but force you to slow enough so you’re running not on a plane, but with your bow up to enable you to better handle the seas. Once again, you could be traveling at a much less efficient speed. The trip will take longer, and you might consume much more fuel. Although engines running at slower speed consume less fuel, there’s more to consider. 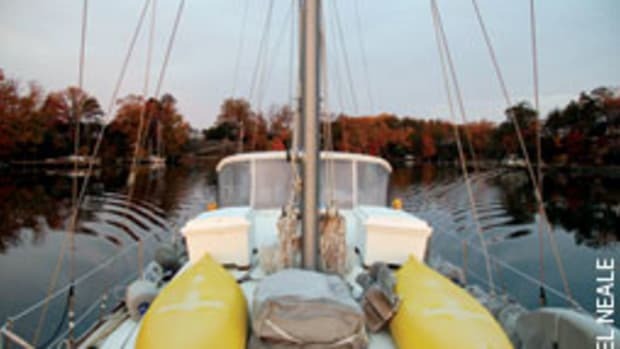 Other factors include waves crashing against your hull while on plane, having to vary your throttle to maintain proper control in big seas (whether from the bow or the stern), having to run with more stern drag because you need your bow up to breast the waves, and running hull down with waves crashing against your hull and adding miles to your trip because you need to “tack” back and forth to safely handle the seas. These, as well as individual boat efficiency characteristics, can result in higher fuel consumption if a current (tidal or other) is working against you. When you plan a trip, you need to know what the current’s going to be doing when and where you’ll be running. The tide table at the marina won’t tell the whole story. First of all, depending on where you are, the tide may reach its maximum high or low at a different time than the current changes. If the tide begins running in at the entrance to the river at noon, for example, it might still be running out strongly halfway up the river. The change in current direction, like the change in tide height, moves up and down the river; it doesn’t change for the entire length of the river at the same time it changes at the mouth. It can be very important to know when the current changes and where. Unfortunately, this information isn’t always easy to find. We’ve even noticed some otherwise very good chart plotters that blow it with their current flow indicators. Determining this varies with your location, but there are ways. For example, in many areas it helps to consider the “rule of twelfths” when you are trying to determine how fast the tide is rising or falling and the velocity of the accompanying current in a given area. This is a general guide for semidiurnal tides where there are two complete tidal cycles a day (high, low, high, low, with a short slack period between each, all within approximately 24 hours). It usually takes about six hours for the tide to completely rise (flood) or fall (ebb). The slack period when the tide is reversing directions varies in duration, depending on the location, the lunar stage, wind and other factors. Consult current tables for this exact information and observe local conditions. You can use the rule to approximate the time the current will slow and become slack or be running strongly. It is important to note that half of the total rise and fall (and therefore the strongest current) occurs during the third and fourth hours. This formula does not apply to lakes or other bodies of water without regular tides, but other factors, such as wind and moon, can cause strong and weak currents even in these areas. It also will not apply in those parts of the world where tide cycles are diurnal, with only one 12-hour rise and fall a day (for example, most areas of the U.S. Gulf Coast, including the western part of the Florida Panhandle, eastern Mexico and some Caribbean islands). 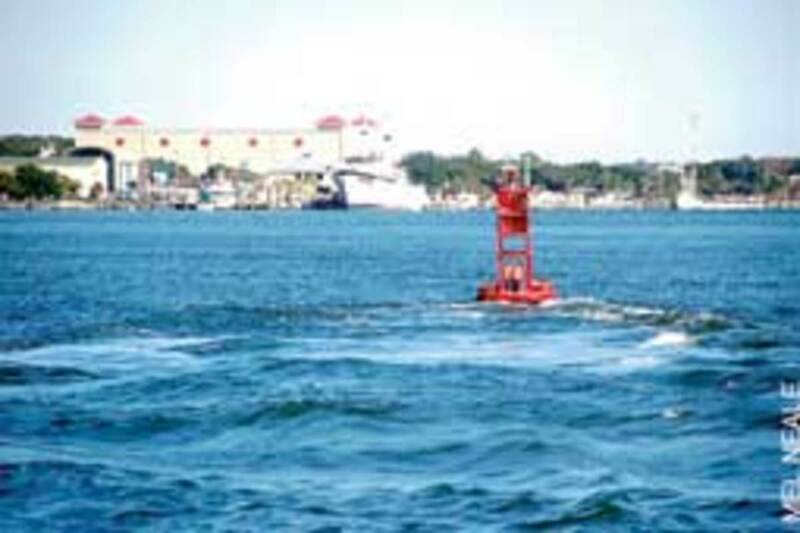 Diurnal tidal areas usually have weak currents with sometimes long periods of slack and little tidal range (the difference between high and low). Some areas have a mixture, where highs and lows are unequal and irregular. Anything you can do to decrease the resistance of your hull to water will help. This includes the obvious, such as keeping the bottom free of fouling and using good paint. 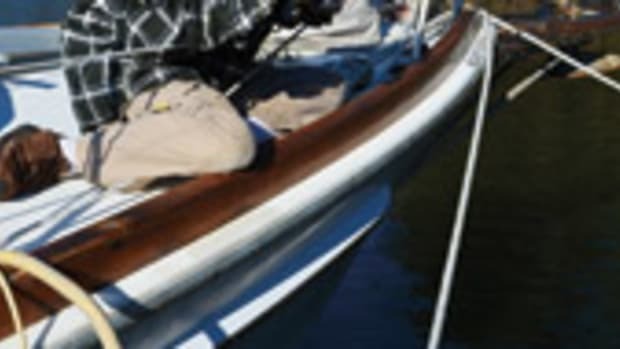 We use Interlux Ultra on our displacement hull, Chez Nous, and Interlux Micron (www.yachtpaint.com) on our planing 1985 Mako, but there are several good brands that offer a variety of paint types to match your hull and how you use your boat. The fuel savings with good paint has never failed to amaze me. On our slow-moving boat, the coating keeps the bottom free of slime and growth for at least two years. The ablative paint on the Mako gradually wears off as we run at speed, taking with it slime and, essentially, polishing the underbody. There are also less obvious methods of decreasing drag. We see many sailboats and trawlers dragging their tenders behind them. This uses more fuel. It’s even worse if the tender has an outboard on its transom. Filling large fuel tanks and water tanks at every stop, particularly on planing boats, also can cost more fuel because of the added weight. Many skippers feel (as do I) that topping off the tanks is consistent with prudent seamanship, but we see more and more skippers add only what they’ll need for the next day’s run because of the savings. Making the right call depends on knowing your boat and engines, being familiar with the run and sea state, and having a good handle on the weather. Running gear is particularly important. Just a very small growth of barnacles, weeds or other fouling on a propeller will substantially reduce speed and increase fuel consumption. In some waters (and in any warm waters), a prop can grow a delaying crop of fouling in about a week. I’ve never found a good antifouling paint for propellers and shaft that remains on, doing its job. This is why diving your bottom frequently can save money. If you have the ability, knowledge and skills you can do it yourself and save big bucks, but even if you’re paying a professional diver you’ll probably save money in the long run. We bought a Brownie’s Third Lung Hookah some years ago, and it has more than paid for itself — not only in fuel savings but also in fewer haulouts. Another way to reduce resistance is to lighten your load. Whether this means going on a diet or spending an enlightening afternoon exploring your boat’s nooks and crannies and removing all that stuff you really don’t need, weight removal can save fuel. Recently I removed hundreds of pounds of no-longer-relevant spare parts and other equipment from Chez Nous. The waterline is higher now, and you can see the difference in performance. 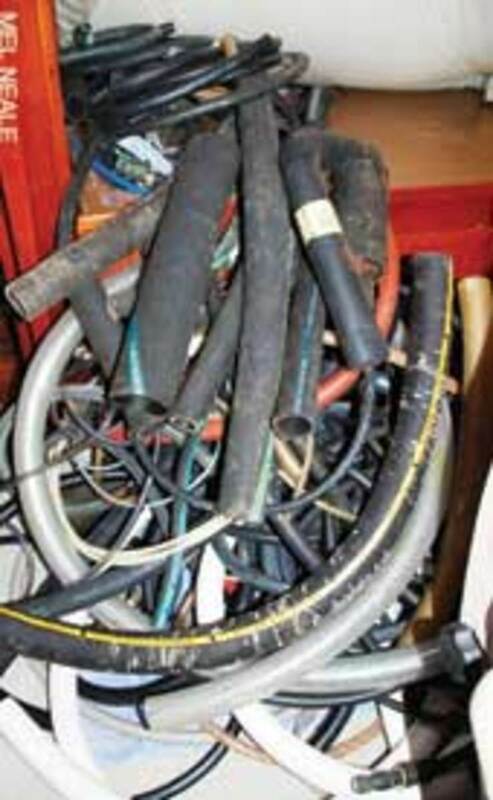 Among the stuff I removed was my huge supply of emergency hose replacements, from exhaust hose with wire insert to potable water hoses — in all sizes. I estimate that I removed more than 100 pounds of hose. I replaced them with a few rolls of Rescue Tape (www.rescuetape.com), which weighs less than a pound. You also can replace heavier gear with lighter as long as it doesn’t compromise safety. For example, you may have a heavy anchor up in your bow. This can affect performance — particularly in planing boats. You might want to replace that with a much lighter but very effective Fortress (www.fortressanchors.com). They’re made of an aluminum alloy and have performed exceptionally well in tests, as well as in day-to-day use, and can be adjusted to various bottom types. Obviously, it’s important to know the rpm range that gets you the best fuel economy, and some people go to great lengths to find it. There are various protocols for doing this. I’ve known of some who spend hours calculating the number of inches their boat will move through the water per propeller revolution. I’m not mathematically versed enough to recommend any one method or even discuss it intelligently, but I look with skepticism on any that overlook the importance of just getting to know your boat. Simply knowing how far your boat will travel per revolution per minute overlooks too many variables. One is slippage. The prop will slip in the water, more so at some times, such as when there’s an increase in wave or wind resistance. And even boats of the same make and model might have different transmissions, different loading and other variances that preclude applying one boat’s numbers to another boat. Many newer outboards supply fuel consumption rates. My 150-hp Yamaha does this, and the information is very helpful. But I still find that rpm economy varies with sea state and loading. For many of us, boating means racing to a marina and then spending money in restaurants, golf courses, tennis, etc. It doesn’t have to be this way. Buy some money-saving toys, such as kayaks. Sure, they cost a bit up front, but if you use them you’ll quickly start to save money — and lose some weight in the bargain. 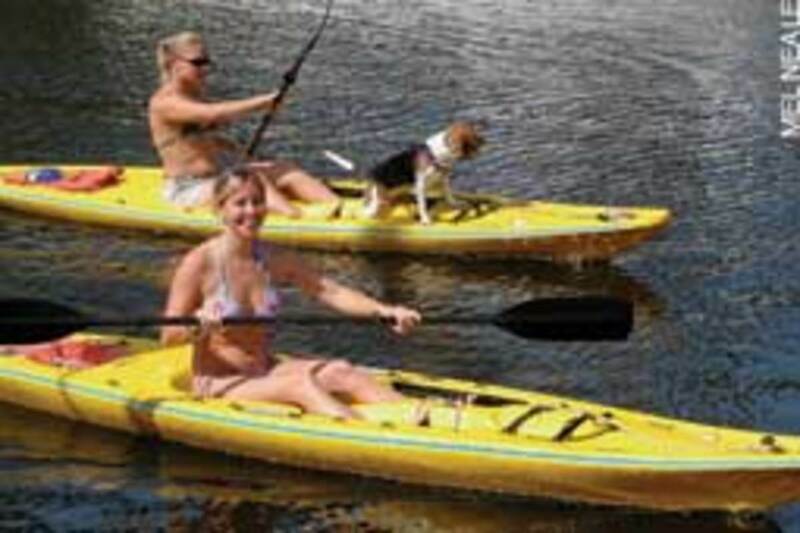 From one of my favorite marinas in St. Augustine, Fla., one can kayak far back into marshy creeks or to a park with ocean beaches, to the historical district and, if you’re up to it (and few of us are) you can do some ocean kayaking. For years, people have asked my wife, Mel, “Do you cook on the boat?” as though it’s an unheard-of pursuit. Even if your boat isn’t decked out with a fancy galley, you can cook, have fun and save bucks. When we’re not using our generator at sea, we use an Origio alcohol stove. It’s portable, relatively safe and capable of cooking some gourmet meals — at far less than restaurant cost. With our inverter, we can use the microwave when we’re under way, replenishing the batteries with the engine’s alternator. Everyone knows it’s cheaper to anchor than go to a marina. But many of us feel uncomfortable with this. The better anchoring gear you have and the more you practice, the more comfortable you’ll be. And there are ways to get around problems associated with being on the hook, such as summer heat. 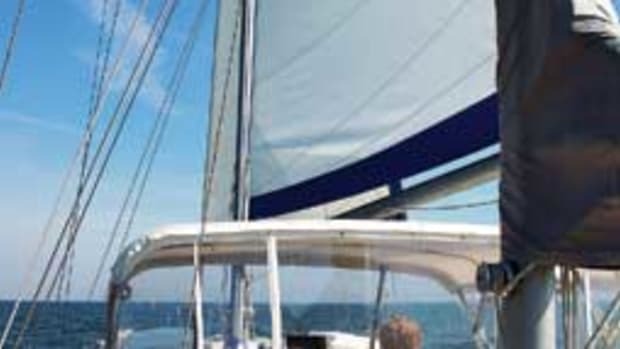 A wind scoop funneling a breeze down a hatch, whether on a sailboat or powerboat, can help you forget that lack of air conditioning. Also, awnings spread over the boat keep things much cooler. They are relatively easy to rig on sailboats, but can be used on powerboats, too. You’d be surprised at how something this simple can help you anchor out and save money. An unexpected breakdown or accident is one of the prime causes of large, unexpected expenditures. They are a major reason that people give up boating. But there are things you can do to lessen the likelihood of these boat-buck catastrophes. We should all be insured. It’s sheer folly to cancel insurance to save money. But we all have deductibles, and far too often repairs fall within the deductible. 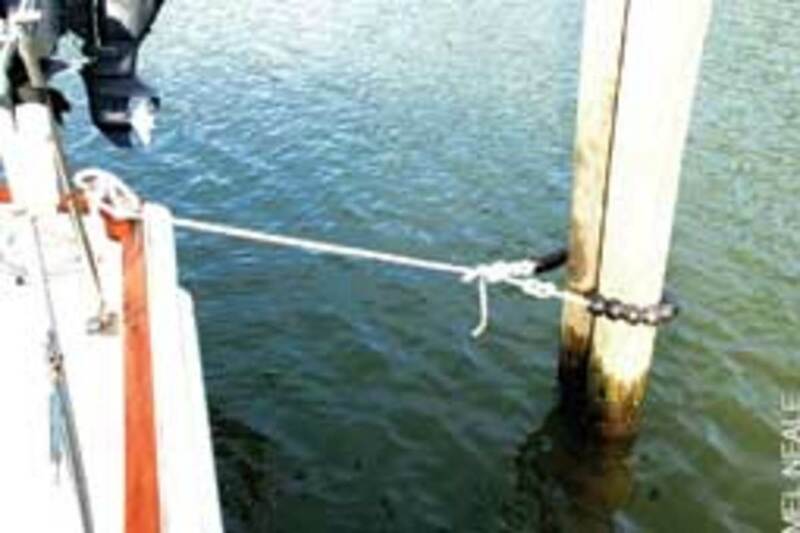 Good seamanship and simply being careful can directly save money and help prevent uninsured losses. But if we’re sitting smugly behind the wheel, thinking that’s what insurance is for as we take chances, we’re far more likely to be paying out money for expenses falling within the deductible. Talk with your insurer about the type of coverage you need and don’t need. Sometimes higher deductibles are appropriate and this saves money. A more limited area of navigation should save money. With BoatU.S. 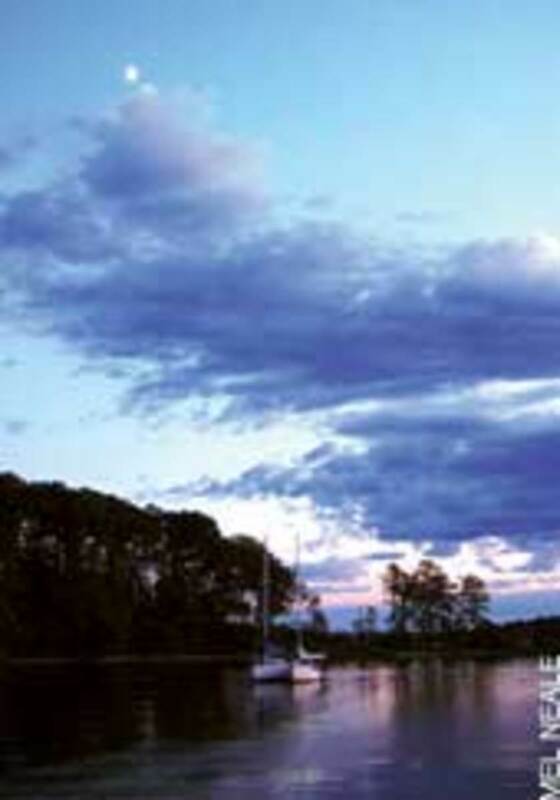 insurance, for example, your premium for non-trailerable boats depends in part on where you are. Chesapeake Bay is a relatively low-premium (safer) area than, say, the Bahamas or South Florida. 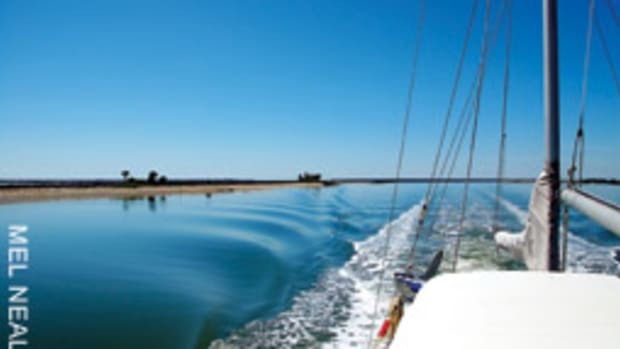 But if you leave the Chesapeake to go south during the winter they’ll increase your premium to cover the extended cruising area while you’re gone — then reinstate, on a pro-rata basis, your Chesapeake Bay premium when you return. 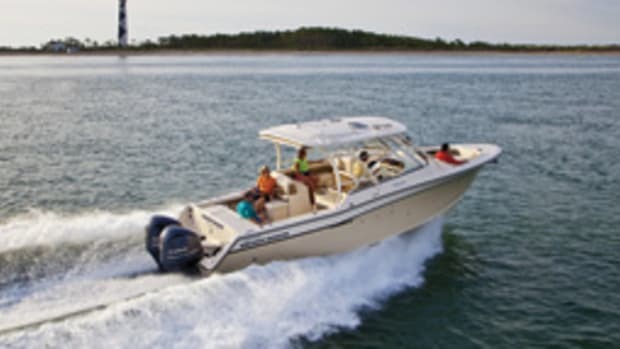 Your boat may be rated in terms of size, speed and other risk factors, and you may be rated inappropriately. If you’ve never made a claim, you should get a break on your premium. If your insurance company is reluctant to discuss these and other issues with you, talk to other companies. Compare. But always take the time to read the fine print. Some insurance deals aren’t deals at all because of omitted coverages and other fine-print rip-offs. Also, be sure you have other types of protection you need. For example, if you tow your boat you may need trailer-towing coverage. Even if your car insurance covers your trailer for some risks, it probably won’t cover towing costs should the car or trailer break down. It’s a real bummer if the towing service you have for your car leaves your trailer and boat sitting on the side of the highway. It’s also a mistake to skip towing coverage for your boat on the water. It’s a great investment. No matter how careful we are, many of us are going to need a tow or ungrounding at some point, and without towing coverage such as those offered, for example, by TowBoatU.S. and Sea Tow, that tow or ungrounding can be extremely expensive. Another way to lessen the odds of unexpected expenditures is maintenance. We all know this, but it’s easy to let it slide, particularly when it involves spending money in hard times. But failure to keep up with maintenance issues can cost money now and in the future. And some maintenance items are do-it-yourself jobs that most can do. A good example might be your end plates. Say what? Most everyone with an inboard engine has one or more heat exchangers. These cool the engine’s fresh water, the lube oil, the transmission fluid, the intake air or any combination of the above. The relatively cool raw water takes heat from the hot liquid or air as the two pass each other in the exchanger. One goes through a stack of tubes, the other around the tubes. Typically the end of each heat exchanger is covered by an end plate, held in place by a bolt in the middle and separated from the external and sometimes internal walls of the heat exchanger by a gasket. Simple enough. But with use, small amounts of water inevitably begin to seep between the gasket and the metal, resulting in corrosion. It doesn’t take many years for this corrosion to eat into the body of the heat exchanger, making it impossible to get a seal. Heat exchangers typically cost thousands, depending on size, application, engine, etc. Many good mechanics recommend that you unbolt the end cover, clean any areas in need and replace the gasket every year. What a hassle! 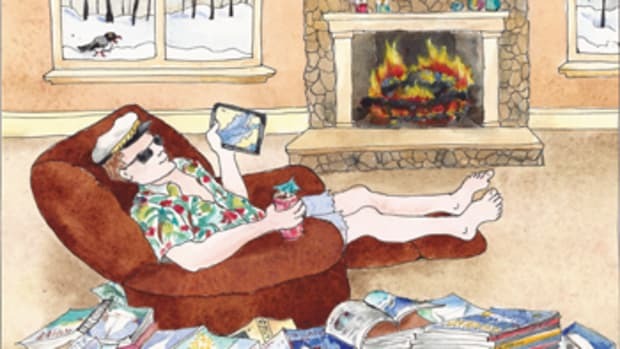 But it isn’t, really, and you can probably do it yourself and avoid a huge unexpected cost down the road — or maybe only further into the season. I love getting press releases and reading what I call the “new, neat stuff” columns in boating magazines. Somebody is always trying to figure how to do something better on a boat so he can write off his own boating or maybe even make some money. A lot of the new products are helpful. They not only do the job intended, but they also save money. Sure, none come free, but if you can spend some money to improve your experience and this also saves money, it may be a good investment. One example of something I’ve recently begun to use is called TideMinders (www.tideminders.com). It’s a simple idea and not very expensive. My friend Bob Adriance told me about them as we were standing on my dock one day, discussing one of our favorite disaster scenarios: storm surges. Bob is editor of Seaworthy Magazine (www.boatus.com/seaworthy) and technical director of BoatU.S. TideMinders, sold by Dr. Shrink (www.dr-shrink.com), are the brainchild of Larry Gray, who has done plenty of boating. They’re balls of polyethylene material. You insert your dock line through the contoured holes in the middle, stringing on enough to ring your piling, and secure them in place with figure-eight knots. As the tide rises and falls, even in areas of high tidal ranges, the balls roll up and down the pilings. Gray says you normally don’t need to adjust your lines, even for storm surges, and you don’t need to have extra-long lines to compensate for elevation changes. Although they float, they’re heavy enough to pull the line down lower than your chock, so when the boat surges on a wind, they act as a shock absorber as they roll up the piling. This helps diminish storm stress on the line and deck cleat, and line chafe at both ends. Gray reports that entire yacht clubs use them, and they’re suitable for a wide range of boat sizes. I installed them in time for one of the tornado-producing storm systems in April. As I stood on deck watching them during very gusty winds, the first thought that came to mind is that I didn’t need the great length of rope I customarily use when rigging for weather at a dock. I only need the length of line required for the distance from the piling to the cleat, plus what’s required to wrap around the piling and to make the knots and cleat wraps, plus a little extra for good measure. As a more complex example, I recently learned of a product with which I’ve long been familiar. It’s apparently much more refined than in earlier days and can be much more of a money saver, as well as an enhancement to cruising. 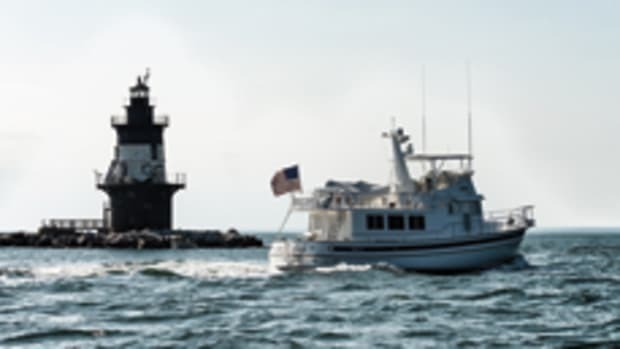 I spoke with Ben Wilde of Wilde Yacht Sales in Essex, Conn., (www.wildeyachts.com), who specializes in Nordic and Ranger tugs. I’ve lived at anchor for many months at a time for many years, and I always thought solar panels simply weren’t cost-effective for me. I’m thinking again. 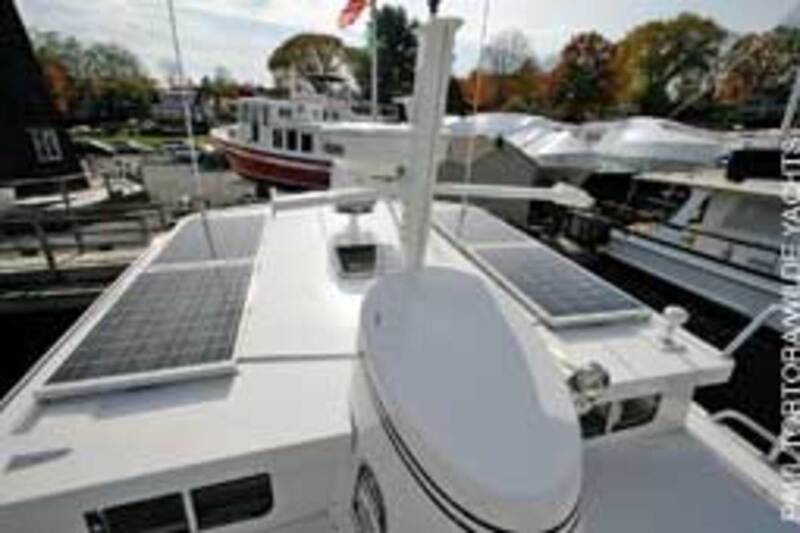 Ben says that in recent years he has noticed more and more of his customers and other cruisers using solar panels. Ben’s personal 54-foot Nordic Tug has six solar panels. With these, he can run, while at anchor, four refrigerators (Frigoboat at www.frigoboat.com), a freezer, a wine chiller and a Raritan 110-volt icemaker. (He uses Kyocera panels, but there are other brands.) He told me that even with these power users, he can go for days at anchor, with judicious consumption, without starting an engine. He does have inverters and a huge AGM battery bank. Ben told me that the panels he uses retail at about $1,200, with regulator. Now I’m thinking that if I ever need to replace another generator (Please, no!) I may think twice, considering the money I’d save with a good array of solar panels and additional batteries. The bottom line: You usually can improve your boating’s bottom line without sacrificing safety or enjoyment. The old ho-hum tactics, such as going slower or not as far, are still good. But with a little research and imagination there’s much more you can do to go boating, spending fewer boat bucks.